We searched for 4 years to buy a boat. And, we had a great time doing it. We went to all the major shows and boating meccas. 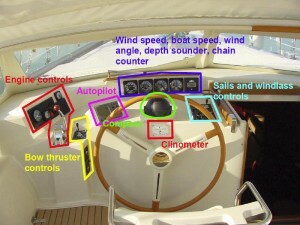 We had our search criteria set up in www.yachtworld.com and browsed most weekends. We soon had it down to a handful of brands. We tried to stay away from vintage or project boats and from our experience with Water-Melon wanted very little teak on the exterior. Don’t get me wrong, we love teak on boats, it’s beautiful. We’re just plain tired of sanding and varnishing. We used a boat broker to help with the process. The brokers have access to the backside of YachtWorld and can inform a buyer how much similar models have sold for and how long the boats were listed. Not only did we have fun shopping, we had fun looking for a home port. We had a major dilemma about multi-hull versus mono-hull. There are vast discussions on this subject and some are very passionate. This can of worms is going to stay shut. They are pros and cons to both. For us, if we planned to cruise the islands and not cross oceans, we could see the many advantages of a cat. But crossing an ocean on a cat is not for us. They have escape hatches on the bottom for a reason. An upside down cat is the beginnings of a bad day. However, you can’t beat the roominess of the aft cockpit and entertaining area. Our opinion, cats are best while at anchor, mono-hull is best at sea. Oops, I may have opened the worms. We looked hard at both options. The deciding factor for us is we got sea sick on a cat due to the unique sailing motion. Enough said. I’ll be the first to admit, this was a big step up for us boat wise. Going from 38’ to 53’ meant unfamiliar systems, a new rig (to a ketch from a sloop) and a whole new learning curve on sailing. We did not intend to buy a boat this large but failed to find our needs in other boats. We tried really hard to stay under 50’. We thought 45’ would be ample enough. Boy, were we wrong. I think we both started our list of things we sought in a new boat by knowing the things we did not want. We had owned a boat long enough to know the things that caused us the most grief. No boat owner wants is to be stuck at the dock or anchor on a beautiful day while those around are having fun. Things break. They always have and always will. It is how one can get to those things that make a difference in a boater’s life. Two times I changed the Perkins 4.108 starter in Water-Melon. To do this, I would pull up the floor boards, lie on my belly over the support struts, not very comfortable, and work by brail. I had only to remove three bolts. Two I could see and one was completely out of sight. The engine was located under the floor in the main companionway. With the floor up, no one else could move around the boat without risk of injury or get close enough to help with the task at hand. While undoing the lowest bolt, the one out of sight, I dropped it. It went into the bilge, yuck! Our bilges weren’t exactly clean. And, as luck would have it, the bolt wedged in the bottom of the bilge against the strainer so I would not come out with a magnet on a string. My arms are only so long and an orangutan was nowhere to be found. Oh, what to do. We dropped some other magnetic stuff into the bilge and eventually managed to knock the bolt loose. We fished all the other stuff out with our magnet and cleaned off the slim. This slim has a life of its own. I believe at the end of the world there will be only roaches and bilge slim that survive. Once this stuff is on you, you need to remove the top layer of skin if you want to live. This wasn’t the only critical bolt or screw that wound up in the bilge. Sometimes, we just sacrificed them to the bilge slim gods and went shopping for new parts. Since our boat was old, often this option did not pan out and we were force to fish in the bilge. We even found tools once lost by the previous owner. My point is, we learned from these experiences. While shopping for a new boat, we paid close attention to the location and accessibility of the engine. It is truly amazing how many boats we looked at in the 45-55’ range were designed with limited engine access. We asked one manufacturer about engine replacement and were told we would need a tremendously talented carpenter in addition to a good mechanic. 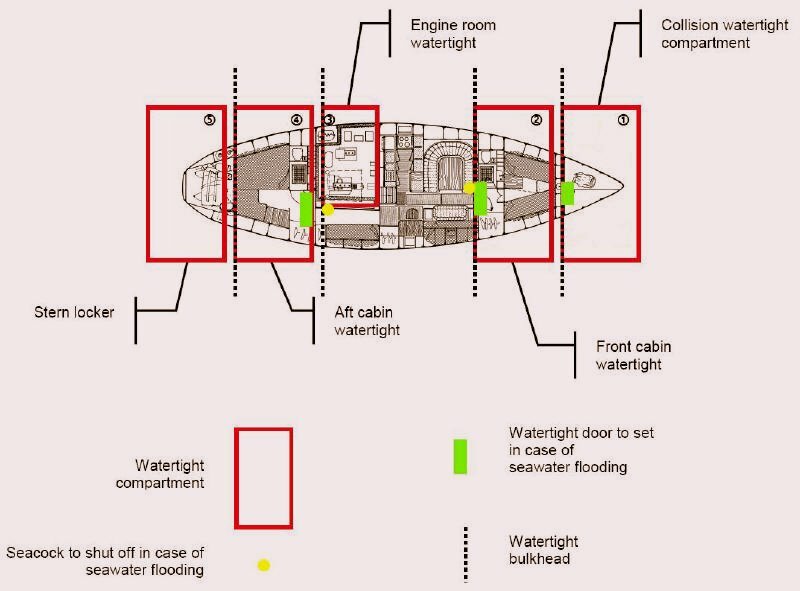 A good number of boats had the engine located under the steps leading up to the cockpit, meaning if you are working on the engine the top of the boat is inaccessible to others. I had visions of lying on my belly in large sea swells trying to get a screw into a hole by the feel and hope method and quite frankly did not find it an appealing quality of a boat. The Amel design offers a watertight engine room with accesses to all systems from all sides. This was a huge selling point for us. The compartment is located under the center cockpit. Access is by a hydraulic assisted hatch. All of the boat’s main systems are located in this area (pumps, water makers, generator, hot water heater, sea chest, bilge). 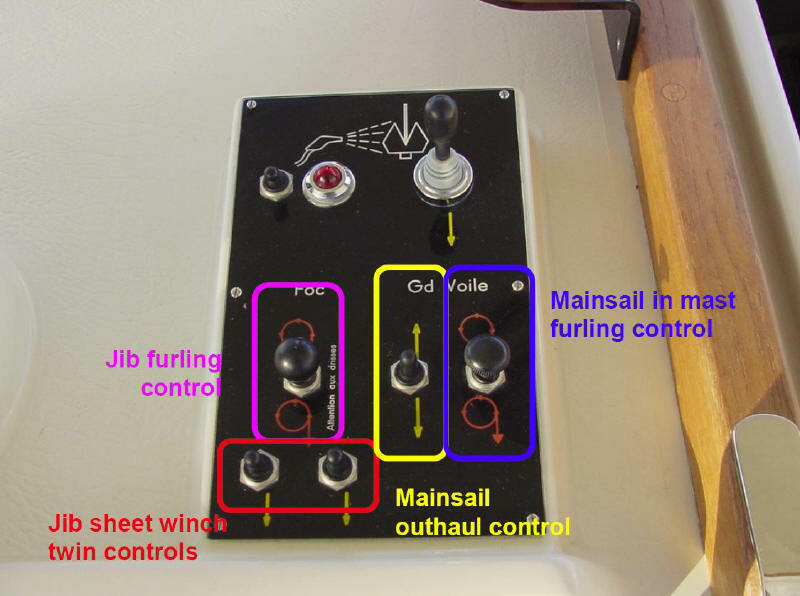 The absolute best part of this design is the interior of the boat never has an oil diesel smell since these components are completely isolated elsewhere. We can work in the engine room, take a break and close the door without having parts and tools littered over the inside of the boat. Safety was a huge component of consideration. The Amel design incorporates 5 watertight compartments and two interior watertight bulkheads. Should we ever be unfortunate enough to strike something while out at sea, our chance of survival is greatly increased. During our hunt for a boat, this was a quick elimination item. Most production boats do not offer compartmentalization. It was possible for us to eliminate entire brands or manufactures once we realized this design feature was important to us. Are we ever going to need it? I sure hope not. Will it keep us afloat? Better to have some chance than none at all. During our mono or multi-hull dilemma, this was a strong consideration for a multi-hull as they float when turned upside down. For us, the inability to right itself outweighed the capability to float. Once a cat is upside down, it stays that way. Of course, the best plan is to never be upside down on the ocean. “One hand for the boat and one hand for you.” This was something taught to me at a very young age. Always, always, always have a hand holding onto the boat while underway whether inside or out. 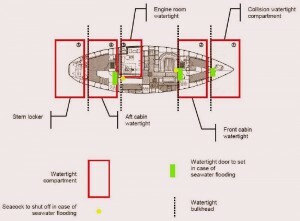 The boat can easily take and unexpected twist, turn or drop causing a person to crash into a table or unpadded corner. Nothing will ruin your day faster than a cracked rib or skull fracture. Being upside down on the ocean might, but we done with that topic now. One boat we viewed in Annapolis had an L-shaped galley. The sink was located on the island section and had plexi-glass backsplash guard in place to protect water hitting the nice leather upholstery. I had immediate visions of someone splitting their head open on the edge while miles away from shore. Needless to say, we passed on this boat. If design flaws such as this were in clear view, what was lurking out of sight? The true amazement of this is the boat I am writing about: it is a production boat from major manufacturer and this was standard equipment. Wide open spaces such as a roomy saloon or open deck found on many multi-hulls are fabulous when in port but can prove treacherous at sea. While moving about our Amel, we are never without a hand hold. In rough rolling seas, we can move throughout the boat without fear of being tossed from one side to another. My only area of concern is the galley. It would be possible to fall into the navigation station. Amel solved this with a protection rope. Anywhere else on the the boat we can abide by the golden rule of safe sailing. Single handed sailing is a must. We wanted a boat where one person could change course, tack and reef without having to wake up others. going to step up our level of sailing. Amel offers the ability to do all of this with the touch of a button. Sails are driven by electric motors (with manual overrides). Electric motors eliminate the need for a hydraulic system and offer years of reliability. One person can operate the boat and adjust every sail without ever leaving the safety of the cockpit. We had mixed feelings about this at first. 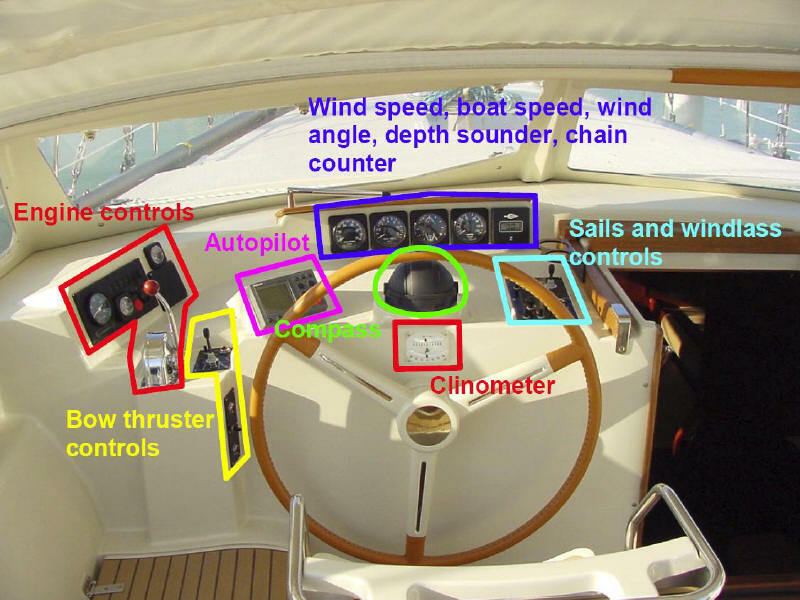 We would have preferred a boat with manual systems driven by a series of ropes leading to the cockpit. Owning an Amel convinced me otherwise. Why have a clutter of ropes leading every which way? The electric motor system offers ease, convenience and no need to struggle with ropes or winch handles (unless the motor is down). Moving down a deck in a rough sea is not something we enjoyed. Never having to leave the cockpit was a must-have. Pushing a button to reef a sail is simply awesome. Please also note the steering is flush mounted in one corner of the cockpit. This eliminates the need to climb over cockpit seats or work around a cockpit table to get to a steering pedestal (or two). The helmsperson is out of the weather and safe in additional to having complete control of the boat. In addition to the standed controls, we also have a secondary monitor for radar and navigaion at the helm. Storage was a key consideration for us. This brings me back to one of the disadvantages of multi-hull boats. Weight is a consideration as the bridge clearance is affected by the weight on the boat. This is not as crucial with mono-hull vessels. We once had some friends who were preparing their Hunter sailboat for a potential hit by hurricane Gilbert in Texas 1988. It took them all day to move their collectables from the boat to their truck. They had one dock cart full of liquor (yes, good friends). We told them it was the first time we’d ever seen their water line. Amel owners enjoy mass amounts of storage. I am not kidding when I say this; we have an excel spreadsheet helping us remember where we have stowed stuff. We can fit more food under the flooring of our Amel than in the pantry of our house. We have two freezers and a refrigerator. We still have empty storage cabinets. But based on discussions with other Amel owners, we will eventually fill up everything and have to raise the water line. Perhaps the best thing about the storage on the Amel is the fact it is all easily accessible. Other boat manufactures expect you to lift beds and sofas to get to storage areas. Not so with us. Because we do not have an engine under the floor, we have tons of dry space. Comfort is important and we would hate to sacrifice comfort. Luckily we don’t have to. We can do dinner for six in the main saloon. We have plenty of space to stretch out and relax. Sleeping is ideal. The center cockpit is large enough for 6 people to eat at the table. The lack of a steering pedestal is brilliant. We can get to the wheel quickly when we need to and don’t have to climb around it while at port. The design keeps all of our self steering components dry and accessible from the inside of the boat. Standard equipment on Amels include microwave, dish washer, wash-dryer combo, air conditioning, well you get the picture, all the comforts of home.